Met-Con is proud to represent Engineered Material Handling crane systems in Florida. EMH is well respected throughout the industrial overhead cranes market because of their high standards of quality and the broad array of overhead cranes solutions they offer our customers. EMH have developed superior overhead cranes applications for the most common load capacity and reliability needs. Single Girder Overhead Cranes offer customers an application for load capacities up to 10 tons and 60 foot spans. With the flexibility EMH box girder technology, Met-Con customers can increase load capacity to 15 tons and 120 foot spans. Because production costs are lower, the EMH Single Girder Overhead Cranes application can be the perfect solution for your company. 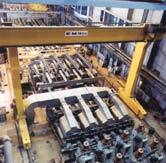 EMH Double Girder Overhead Cranes generally work in capacities of over 10 tons and 60 feet. A big advantage of EMH Double Girder Overhead Cranes are that they can provide high hook lift by pulling the hook up between two girders. This overhead crane application is ideal for when heavy service and speed are essential. They are also well suited for areas where walkways, crane lights, and magnet cable reels are needed as well. For maximum headroom, side approach capability and utilization of existing building space, the Under Running Crane application is ideal. With a standard capacity of 10 tons (special configurations up to 25 tons and 90 feet), Under Running Cranes are the answer. Often times, overhead runways are not possible. If you need an overhead crane application with unlimited load potential, flexibility in capacity span and height, but adaptable to certain space requirements, you need an EMH Gantry Crane System from Met-Con. For those situations where a customized overhead crane application needs to be considered, count on Met-Con and EMH to help you develop an application that fits your needs. Special Cranes are part of our business, and Met-Con and EMH have the Engineering skills to design the perfect solution for your special needs. Please contact Met-Con today for a quotation on your EMH overhead lifting, crane and special material handling requirements.